The new Terminator movie could be stealing your clothes all over again. After four movies, the Terminator franchise is in an interesting shape, and it's not one that some people really like. The upcoming fifth movie may sidestep this problem though, as Hollywood insiders are suggesting that it might go back to the beginning and reset everything. According to the rumors, the new Terminator movie will have some kind of temporal tomfoolery that results in an alternate timeline, not unlike JJ Abrams' Star Trek reboot. Just as with the Star Trek movie, this reset would allow the filmmakers to go back and tell a new version of the original Terminator story with new actors, and in the process, neatly avoid the tangle of continuity. The same rumor mill suggests that Paul Walker, of Fast and Furious 5 fame, is in the running to be the new Kyle Reese. There is a small problem, however, and that's a certain former Californian governor's recently revealed indiscretions. The news that Arnold Schwarzenegger had secret lovechild caused him to put his movie comeback on hold, but insiders say that the new rights owner, Megan Ellison, is eager to get the movie up and running. What may happens is that the creative team will cut the amount of screen time Schwarzenegger has in the movie, in the hope that it will be easier to convince him to film it this year. It's not hard to see why Ellison would want Schwarzenegger on board for the movie - his name is pretty much synonymous with the Terminator franchise - but it's a shame in some ways that the new cast doesn't extend to every character. 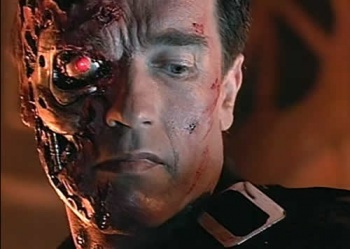 Schwarzenegger was great in the first two movies, but it would be interesting to see a new actor put a different spin on the cybernetic killing machine.